From Tivoli you can walk through Viale Arnaldi (also known as Viale Cassiano) forward S.Gregorio. Just beyond the park of Villa Braschi on the left, you'll see, after few meters, on the right-hand side a little blind street named Pomata (or Pussiano). Its name would derive from a Roman goddess protector of the fruit trees that were planted in this area. Here many Roman aristocratics, the Patricians, were used to build their villas. They chose this area for two reasons: the first one is the wonderful sight; the second one are the aqueducts whose ruins still stand. Along this walking route, you can see also an hemicycle with some seats. It was built by the City Hall of Tivoli in 1750 in order to allow the tourists and aristocratic people to rest themselves and to admire the beautiful view of the Roman plain (ancient Latium). This place is famous as the "Girata delle carrozze", where the walking ended. "D.O.M. CASSIANAM HANC VIAM AMOENITATE CIVIBUS EXTERISQUE IUCUNDAM AD COMMODIOREM DEAMBULATIONEM CURANTE ALEXANDRO DE SPETIA MEVANATENSI TIBURTINAE URBIS PROPRAETORE S.P.Q.T. LATIUS APERIUT COMPLANAVIT ORNAVIT ANNO JUBILAEI MDCCL"
(In 1750, year of Giubileo, the Senate and the people of Tivoli improved this street, in order to make this walking comfortable as possible, with the interest of the vice-governor of Tivoli, Alessandro Di Spezia da Bevagna). 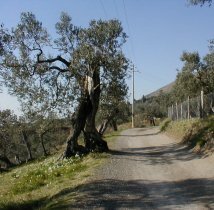 While continuing to walk, you'll arrive to the locality "Due Miglia", where there is a lapide that remembers the brother of E.R. Franz, a famous painter of the 1800s. This road indeed was one of the most loved places by the English and German painters of the 1800's. 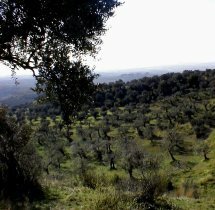 Yet today the road passes through secular olives , bushes, green pastures where sheeps graze, on the hills of Tiburtini mountains. There is a wonderful sight on Hadrian's Villa, on the Roman plain and on the near Albani hills. Along this road, it is possible to notice some ruins of Patricians villas (the Villa of Cassio, the Villa of Bruto and numerous smaller villas) and of Roman aqueducts (Anio Novus and Anio Vetus ).